When I moved, I was in the market for a new kettle. This was for a few reasons, the primary one being that the stove top in my new place is glass top and doesn’t evenly heat things unless it has a completely flat bottom (of which the kettle I had access to did not). That and I love drinking tea, and the idea of being able to select a temperature setting that was ideal for whichever tea I was drinking was a concept I could get behind. I had asked my friends on Facebook to see which kettles they were using – the Breville IQ and a Cuisinart kettle were the ones mentioned, both in comments and in private messages. 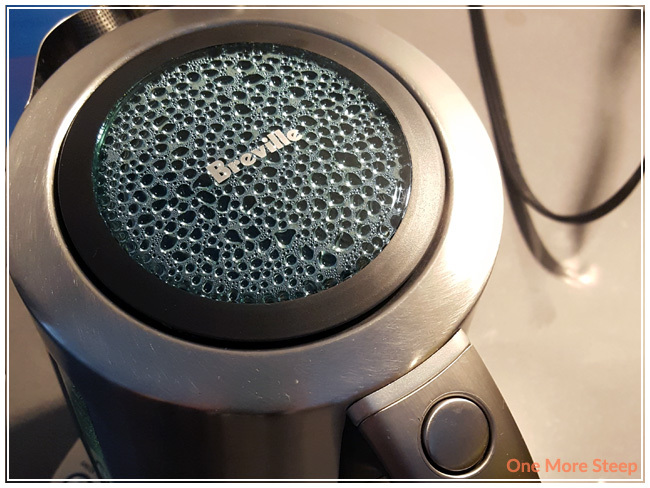 After reading many reviews, I decided to get the Breville. I ordered mine off of Amazon.ca for less than MRSP with free shipping. This has been, without a doubt, the most expensive item I’ve bought related to my love of tea so far. The IQ Kettle comes in a sturdy cardboard box. There’s not a terrible amount of internal packaging – some cardboard forms that hold the kettle and the base in place, along with a manual (in English and French). There’s no styrofoam, which I appreciate from a recycling/green point of view. A nice feature of the kettle is that the IQ Kettle has a 1.8L (2 quart) capacity. There are clear indicator windows on both sides that have measurements for either metric or imperial. 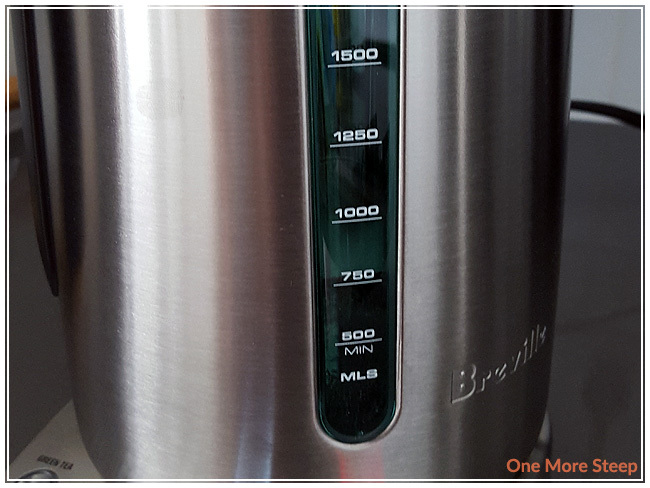 The minimum amount of water needed to use the kettle is 500mL or 2 cups, the maximum is 1800mL or 8 cups. It has 5 temperature settings: green (175°F), white (185°F), oolong (195°F), French press (200°F), and boil/black tea (212°F). There is a keep warm option, which keeps the water at the temperature for 20 minutes. 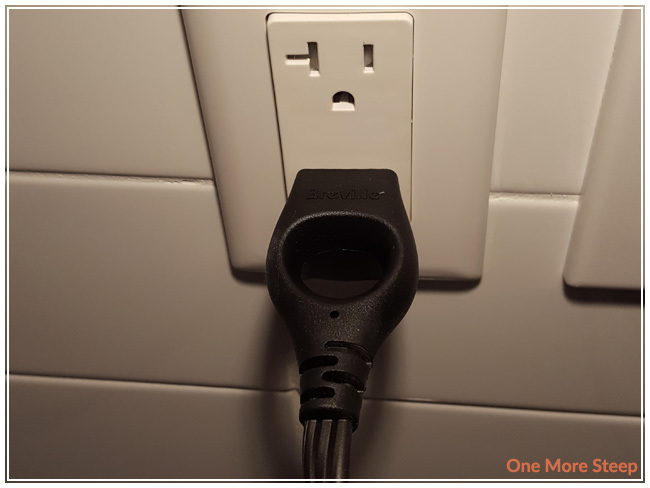 The base plugs into the wall, the outlet has a loop which is apparently meant to make it easier to unplug the kettle. I don’t find it any easier or more difficult to use compared to a regular plug. 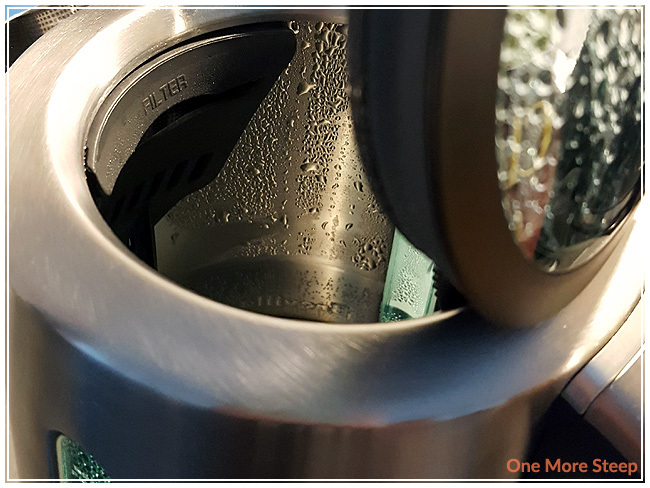 The IQ Kettle also comes with a removable scale filter – it has a stainless steel filter with a plastic frame. I don’t live in an area with heavy water, so I don’t anticipate any build up on a regular basis to be cleaned off of this. When in use, the outside of the IQ Kettle does get a little hot – the handle remains cool to the touch when the water is being heated. Because of the heat, I would recommend only using the handle when wanting to handle the kettle (don’t use your hand to support the body of the kettle). As you can see in an earlier photo, it comes with default English text and temperatures in Fahrenheit. Mine came with a sheet of stickers for French text, since I am in Canada. There were no stickers for temperatures in Celsius. I don’t mind this too much because I often choose temperatures based on the type of tea. There is no option to select your own temperatures, but it does cover a fair number of choices that I don’t think that is too much of an issue. The IQ Kettle makes three beeping noises when the water is done reaching the desired temperature, and it isn’t too noisy or grating. The buttons light up to the selection and when the water is heating, the Start/Cancel button is red. Otherwise when the kettle is in use, the buttons light up white. 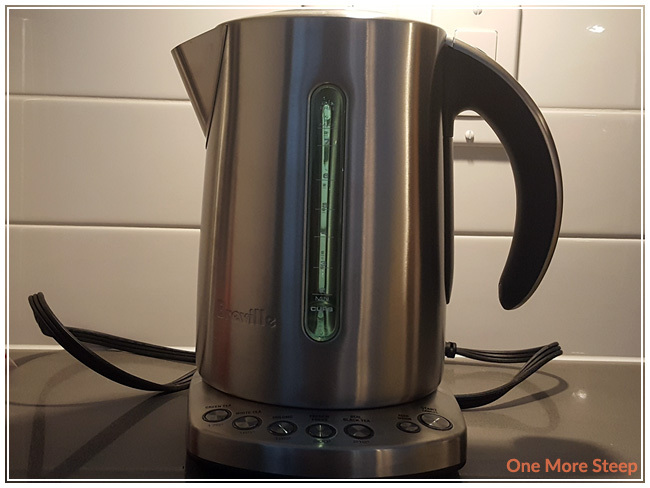 I did test the IQ Kettle to see how long it would take to heat up water. When heating up 750mL (3 cups) of water on the green tea setting, it took 2 minutes and 23 seconds. When heating up the same amount of water on the black tea (boil) setting, it took 3 minutes and 34 seconds. 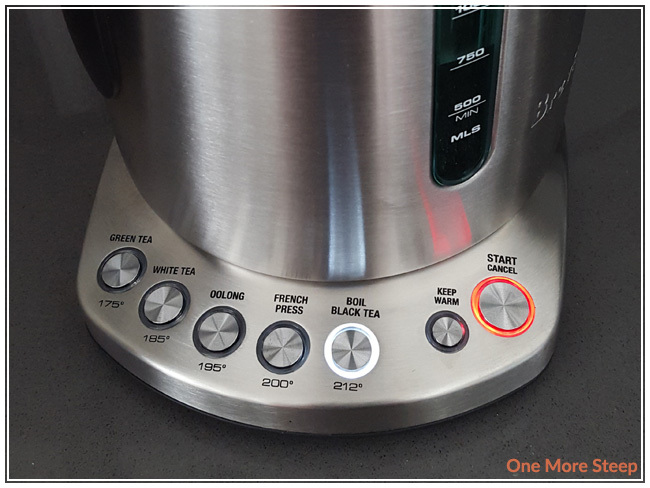 A neat feature with the IQ Kettle that I like is the button that opens the lid. I’ve had kettles before where when you push the button, the lid just pops open because it’s held in by a spring. The IQ Kettle lid opens slowly, so there’s no risk of water flying into your face – always a nice plus! 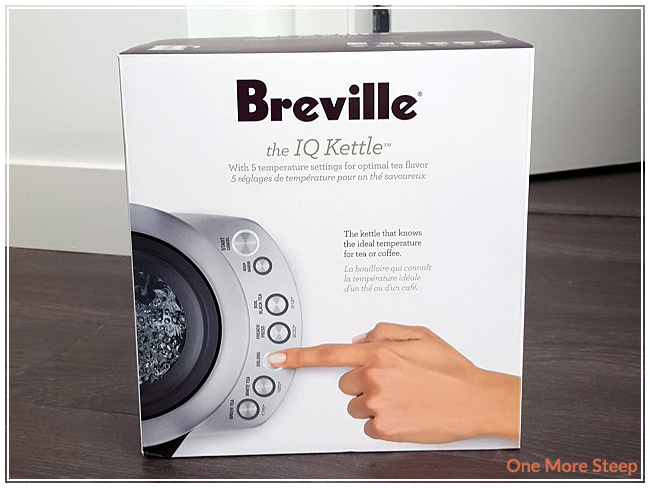 The Breville IQ Kettle is not the cheapest variable temperature kettle out there on the market. There are a lot of different types of variable temperature kettles – all with different volume capacities and temperature options. I really like the IQ Kettle for ease of use, and it covers the temperatures that I use most frequently, so it fits the needs that I have. It does have a high MRSP at $199.99, so I would recommend looking for it on sale. I think it is great though, and it does everything that I’m looking for in a kettle so I’m happy with the purchase because it makes steeping tea a breeze. I own a Breville too. I’ll have to give the keep warm feature another try. I did not find it to hold the temperature for 20 minutes. It did hold the temperature for me for 20 minutes, but as soon as you lift the kettle off of the base that feature gets turned off, so you can’t just pour a little bit and pop it back on (which is a little bit annoying, but I can understand it from a safety perspective! ).